On the nose we find caramel and peach with some enticing floral hints. The body is a bit on the lighter side, reminding us of the fluffy texture vanilla bean brings to mind. Sweet apple and lush peaches are the highlights in the flavor, complemented by juicy fruit and sweet buttery caramel. The bitterness is minute, with delicate tannins and a little rose florality. Soft sweet fruit brings home the finish with perfume-like florals and a little nuttiness. Categories: Coffee Ratings. 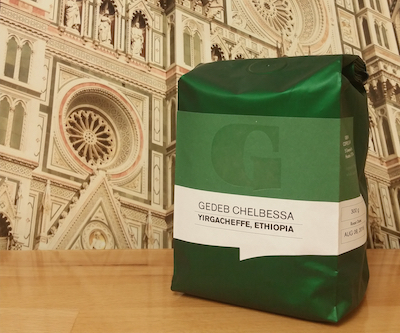 Origins: Ethiopia and Yirgacheffe. Flavors: Apple, buttery caramel, Caramel, Floral, juicy fruit, Light Body, Nutty, Peach, Rose, Tannins, and Vanilla. Brew Descriptors: Citrus, Clean, and Mellow.